Applications for the UK Team – 2017 AIDA Depth World Championships in Roatan, are now open. If you are interested in competing for the UK in Roatan please let us know by 15th February. Please send an email to competition@britishfreediving.org listing your highest AIDA ranked performances since September 2015 in Free immersion, constant weight and constant weight no fins with details of where this ranking was obtained. If you do not have a ranked performance in any or all of these disciplines, please let us know your current best performances in training, and when you anticipate seeing those ratified officially. If you anticipate achieving a higher ranked performance in any of the disciplines in the next few months, please also let us know that in your email. If your geographical location makes it difficult for you to gain a ranked performance, please let us know and we will take this into consideration. If you are interested in going to Roatan as Team Captain/Coach, please let us know you are interested by letting us know your experience in this area, and why you think you would be good for the job. Applications for the Team Captain/Coach position will be considered by the team once they have been selected, and appointed within one month of final team selection. If you make the decision to apply for the 2017 team, you obviously need to be available to be in Roatan for the dates above. You also need to be sure you can afford your flights and expenses and the entry feesIn the meantime the BFA will be doing all it can to gather both sponsorship and logistical support for the 2017 team. The BFA are delighted to introduce the UK Team for the 2016 AIDA Team World Championships! The 2016 AIDA Team World Championship in Kalamata (www.aidaworldchampionships.com), which will run from 17th to 25th September, in Kalamata, Greece. The team comprises of 6 athletes: Georgina Miller, Beci Ryan, Carl Atkinson, Adam Drzazga, Tim Money and Adam Mustoe. Athletes will compete in 3 disciplines, Static, Dynamic (both pool) and Constant Weight (depth) to achieve best possible combined point score. BFA is confident the team will perform to the best of their abilities and we wish them well. Elios Sub (www.eliossub.com), established in 1977, prides itself on its continuous innovation, evolution, improvement and refinement of comfort in its suits. Elios are a loyal sponsor of the British Team and many British Freedivers wear their suits across the UK because of the quality and feel of materials used. Team GB wear their suits with pride and are grateful for Elios’ continued support. Divesangha (www.divesangha.com), manufacture ethically and locally, trade fairly, design wisely and consume responsibly. Their latest collection is made using ECONYL (a yarn that comes from 100% regenerated nylon from fish nets and other waste material). Motivated by passion, uniqueness, innovation and a love for the sea. This is the second year Divesangha have sponsored the Freediving Team and this year they invited the team to have a say in the design! Saltfree (www.saltfree.biz), based at the NDAC, Chepstow, is a freedive school and training facility with the largest purpose-built freedive platform in the world, offering four training lines over 80mof water. Founded in 2003, SaltFree offer courses from beginner to instructor level and run regular training meets for qualified freedivers. Visit www.saltfreedivers.com to find out more! Saltfree have generously supported our Freediving Team GB over the years with their fantastic set-up and facilities. Orbiloc Dual Safety Light (www.orbiloc.com), is a Danish-made high quality lightweight LED safety light that helps to maintain visibility in low light conditions, particularly when freedivng away from the line. They are low profile, easy to wear and very powerful underwater. Waterproof to 100 meters (IPX8 certificate), extremely resistant to impact (can withstand a pressure of 100 kg), with a 3-year warranty. The light comes in 5 different colours (red, white, blue, green and yellow), in 3 models and with 2 operating modes (steady-on and flashing). The base of the light is the same, but the attachment differs between the models with either an arm strap or a clip that fits a weight belt. British freediver Dean Chaouche set a new UK Record in Constant Weight No Fins (CNF) of 74m on the opening day of the Vertical Blue depth competition in the Bahamas. Since 22 April, the world’s top divers have been challenging each other to dive deeper, some further than anyone has been before. Three World Records were also set at what has become the premier freediving competition in the world. Two days later (24 April), Dean then became the second British man to reach 100m in Constant Weight (CWT). Dean said on Twitter that “It’s been very hard to get here, there have been many hiccups, but I’m glad I made it!” Dean has been living on Long Island by Dean’s Blue Hole, where the competition is held. Although not named after him, it’s fitting given he’s become so comfortable diving here regularly. Dean put his success down to working hard on swimming technique, diving regularly and training his body and mind to be more tolerant to carbon dioxide. His National Record feels all the better for the frustration he felt missing an opportunity to set the record in 2015. His persistence has paid off – along with the CNF national record he came 3rd overall in the competition and 2nd in the CNF discipline. Fellow Brits Liv Phillip and Georgina Miller also found success at Vertical Blue, ranking 6th and 8th respectively. Despite ill health during her stay on Long Island, Liv achieved a 63m Free Immersion (FIM) dive which gave her 4th place in that discipline and Georgina performed a personal best. 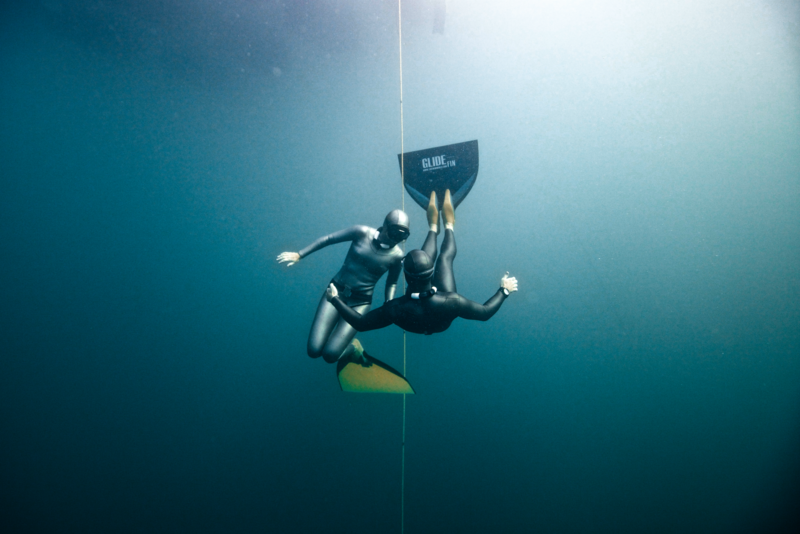 The competition closed with not one, but two World Records by British-born, New Zealand freediver William Trubridge in Free Immersion to 122 and then 124m. That followed an impressive CNF World Record of 72m set by Japanese freediver Sayuri Kinoshita. The events kept us all on the edge of our seats for almost two weeks! The BFA are delighted to announce the UK Team for the 2015 Individual AIDA Depth World Championship (www.freedivingcyprus.com/wc-2015), taking place in Limassol, Cyprus. Athletes will compete in 3 depth disciplines: Free Immersion (FIM), Constant Weight with fins (CWT) and without fins (CNF) during the 9-day long event in September (11th to 19th). The UK is sending the following strong and experienced team of 8: Liv Philip, Michael Board, George Miller, John Moorcroft, Helena Bourdillon, Tim Money, Beci Ryan and George Close. It is well worth mentioning that Mike Board was invited to the event as a Wild Card holder in CWT and FIM (meaning he was ranked Top 10 in the world last year in those disciplines). The UK Team are all self-funded and to help them perform their very best they are being generously supported by sponsors Elios Sub (www.eliossub.com) Divesangha (www.divesangha.com), Bounce Energy Balls (www.bouncefoods.com) and Saltfree (www.saltfree.biz). Elios Sub was established in 1977 and prides itself on its continuous innovation, evolution, improvement and refinement of comfort in its suits. Elios have sponsored the British Team for a number of years and many British Freedivers wear their suits across the UK because of the quality and feel of materials used. We are extremely proud and grateful for Elios’ continued support to our athletes. Divesangha is made up of designers based in London; they are motivated by passion, uniqueness, innovation and a love for the sea. The word “sangha” means “association” or “community” in Pali and Sanskrit. They design and create basic, easy to wear clothes that give divers a proper identity. They call it “divewear” or “surface gear” and the designs mix fashion and sportswear, using functional fabrics and neutral colours. They manufacture ethically and locally, trade fairly, design wisely and consume responsibly. The divewear clothes are made in the UK as an exclusive, limited edition and they don’t use any plastic bags in their packaging when you buy from the website. This is the first time that Divesangha have sponsored the UK Team, we are delighted to have them on-board and the athletes will be proud to wear their surface gear! Bounce Energy Balls are an amazingly convenient and tasty way to nourish your body, satisfy your hunger and sustain your energy. Bounce Energy Balls are a special combination of high quality proteins, carbohydrates, vitamins, minerals and essential fats. After a freediving session, recovery is of great importance and the Bounce Energy Balls have all the necessary ingredients to help our athletes do so. This is the second year running that Bounce have supported our athletes and we are pleased to have them back this year. Saltfree, based at the NDAC, Chepstow, is a freedive school and training facility with the largest purpose-built freedive platform in the world, offering four training lines over 80m of water. Founded in 2003, SaltFree offer courses from beginner to instructor level and run regular training meets for qualified freedivers. Visit www.saltfreedivers.com to find out more! Saltfree sponsored the UK Team in 2012 and we are over the moon to have such a brilliant set-up available for our athletes to use.